The reviews/giveaways might not take place on the exact date listed above, but definitely in those weeks that begin with the date. A big thank you to our blogging friends for taking the time to review the patterns and host giveaways on their awesome blogs. 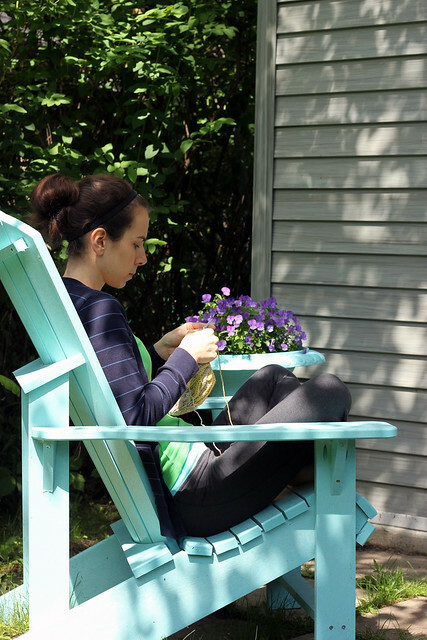 If you see a blog on this list that you aren't familair with, you should really check it out- all these ladies have great blogs that are worth following. Things have been cruising along here at TFA. It's hot, hot, hot! 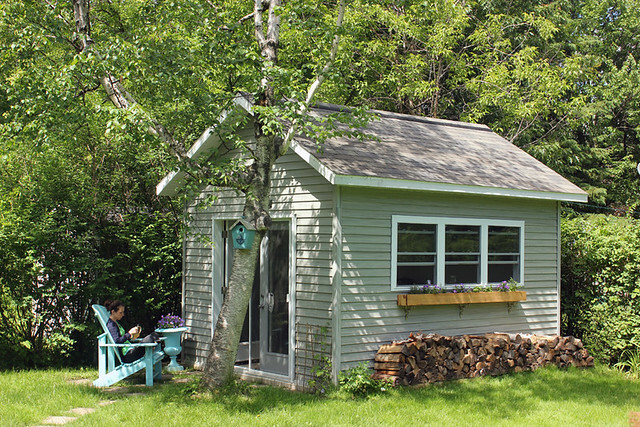 But thank goodness we've got AC so I can still spend my evenings sitting inside with my knitting. Most of the time things turn out well. 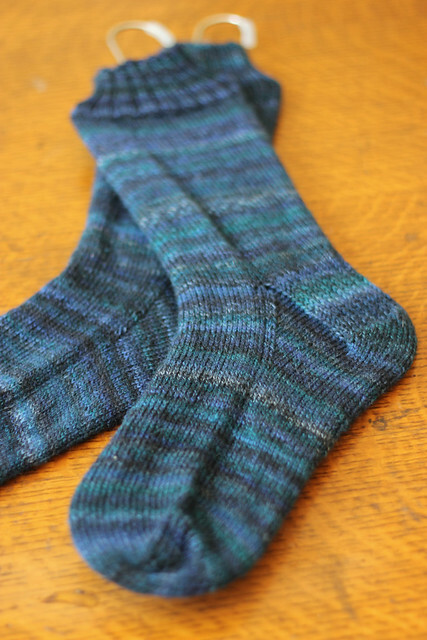 I finished a pair of plain old stockinette socks. They'll be gifted to either my brother or my dad this Christmas. 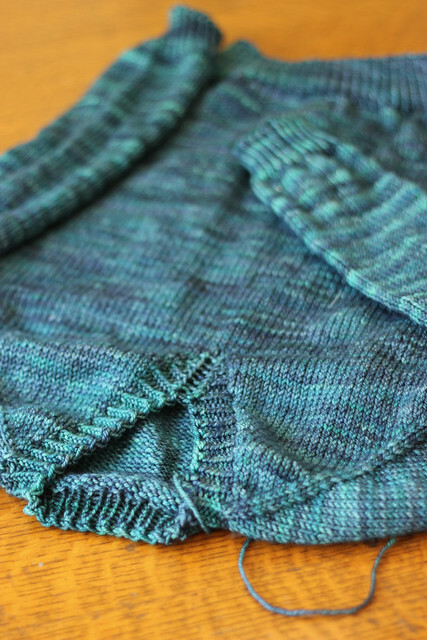 A few details can be found on my Ravelry project page here. 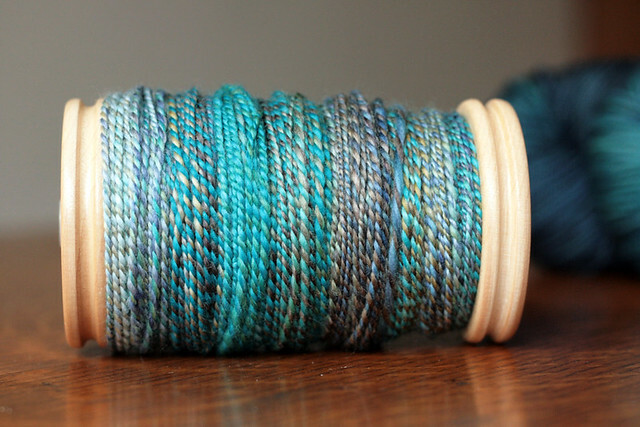 I also managed to finish up some spinning that I've had on the go for quite a while. This 2-ply was spun from a batt I got a few years ago. 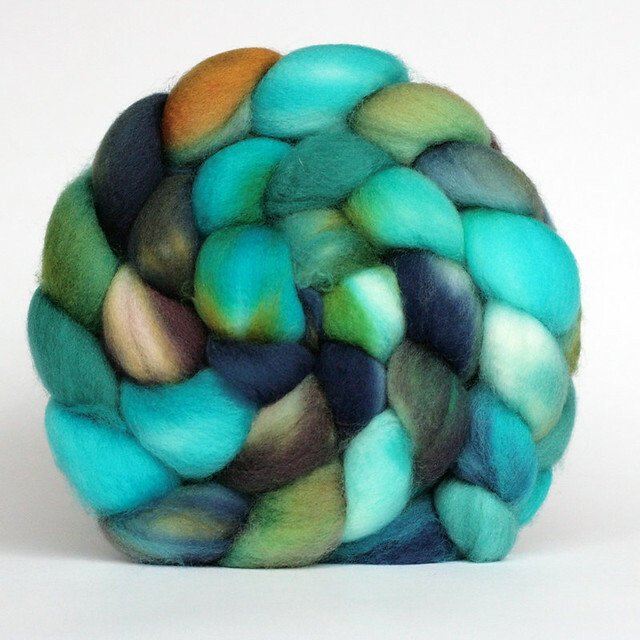 I'm slowly spinning my way through all the colourful batts. 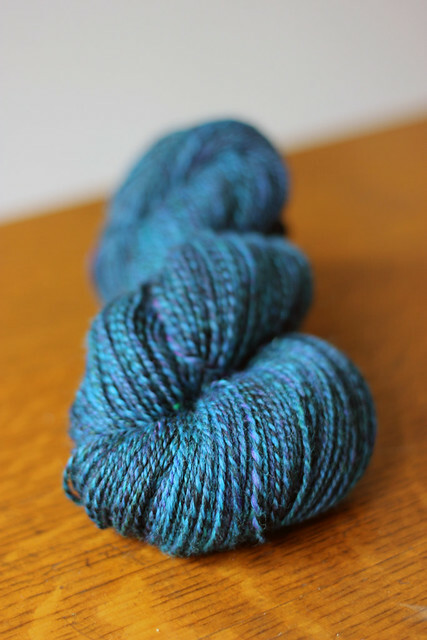 This yarn ended up with a really pretty heathery look. It's less crazy-multicolour and more classy-turquoise-tweed looking. I've got 97g, 267yds. Plenty for a nice little project. It's not all good news around here. I finished this sweater that I've been casually working on for a few weeks. It's supposed to be a nice deep v-neck sweater.... yeah, not so much. The v-neck fits more like a high mock-neck! I clearly made some very big miscalculations... I really like the colour though, so I'll figure something out. To be revisited when I get in the mood to do some problem solving! Oh well, in knitting, you win some and you lose some. 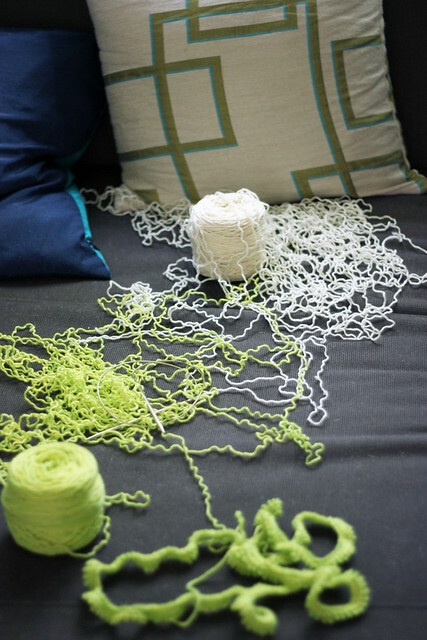 Maybe that yarn is just destined to be something better! 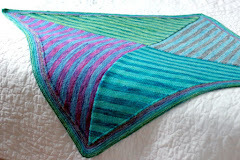 The Tanis Fiber Arts Colourwork KAL has wrapped up! 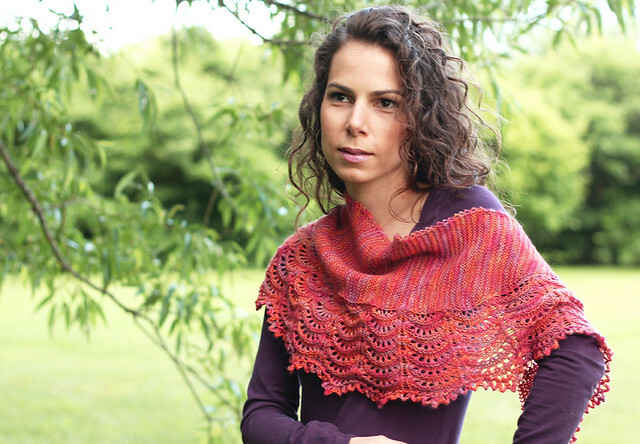 This KAL had a prize: a palette pack in the colour of the winner's choice. 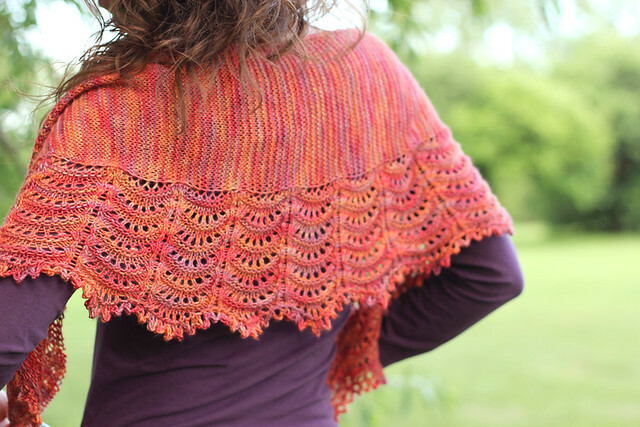 Out of the 29 projects completed in time, Rhonda and her Cashmere Affection were chosen (hooray for the random number generator- otherwise it would have been too hard to choose myself!). Congratulations, Rhonda! 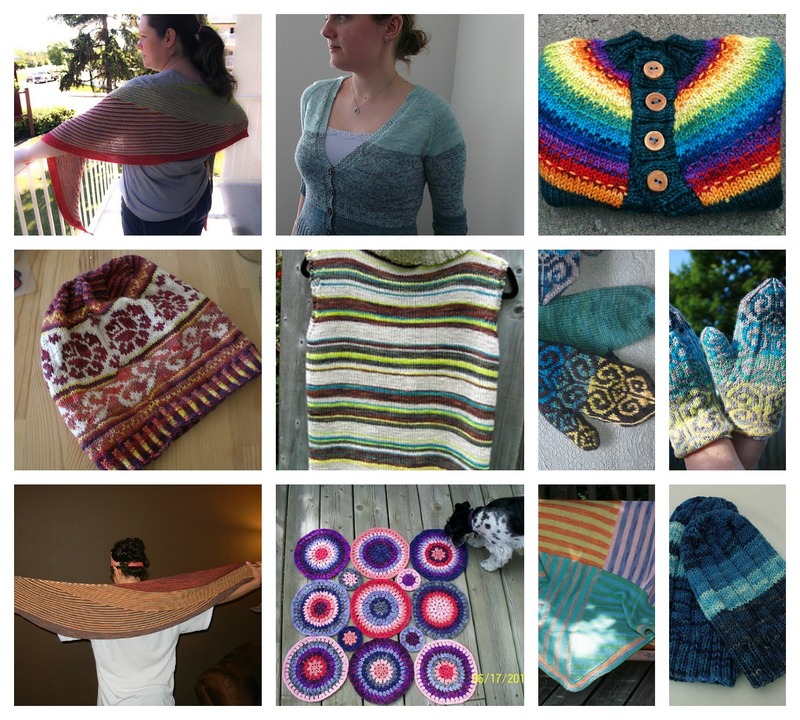 (Horizontal, Above) Row 1: Lesley's Jaffa Cakes shawl, Christine's Plume shawl, Andrea's Color Spectrum Cardigan. 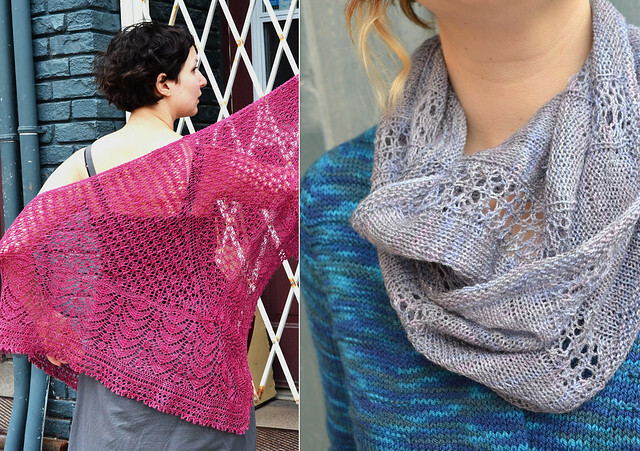 Row 2: Katie's BSJ 3, Shireen's Neopolitan Ice Cream Shawl, Yvette's Sunflower Socks. 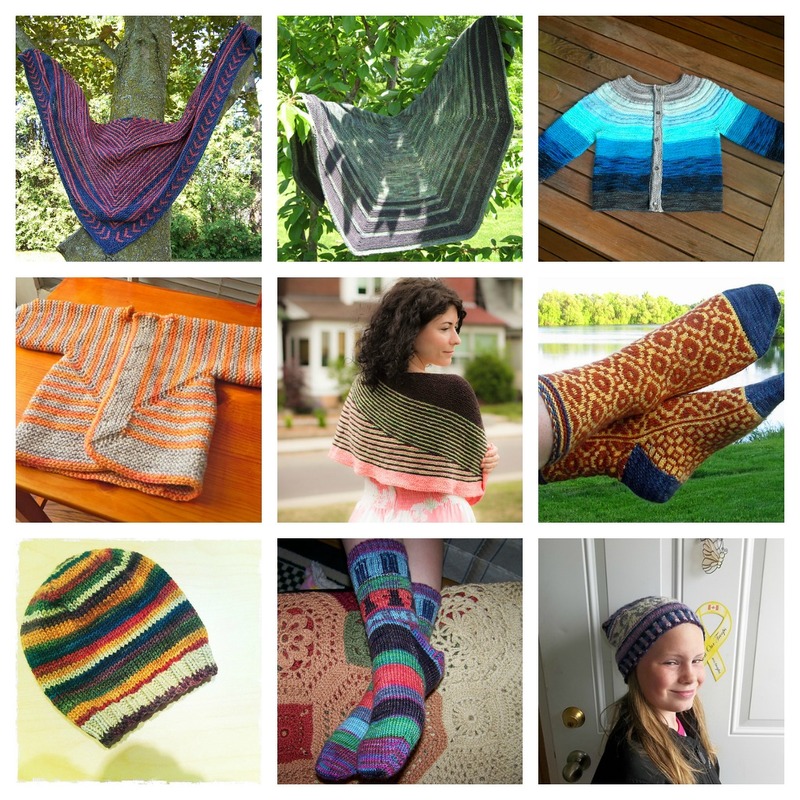 Row 3: Shelley's Little Striped Hat, Lesley's All of Time and Space Socks, Mary's Four Seasons Summer Hat. 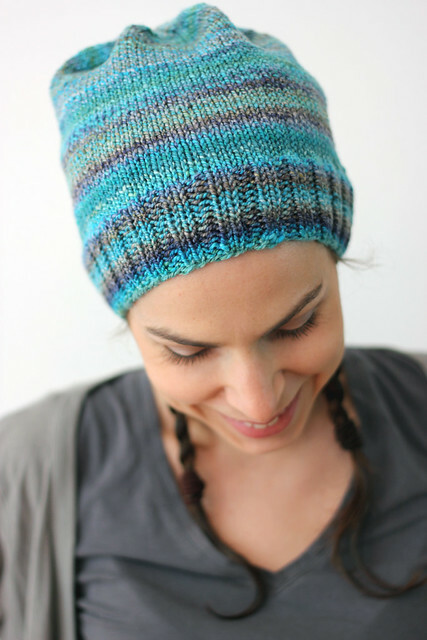 (Horizontal, Above) Row 1: Debbie's Affectionately Colorful, Dee's Citrus Color Affection, Evelien's Four Season Spring Hat. 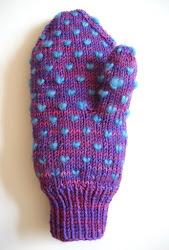 Row 2: Christine's Nightlock shawl, Sarah's Fiddlehead Mittens, Laura's Golf Head Covers. 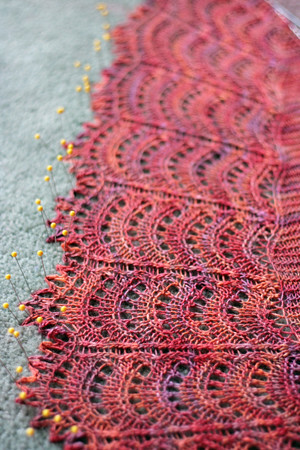 Row 3: Thormoo's Purple Affection, Tanya's Velvet Morning, Jolene's Summer Color Affection. 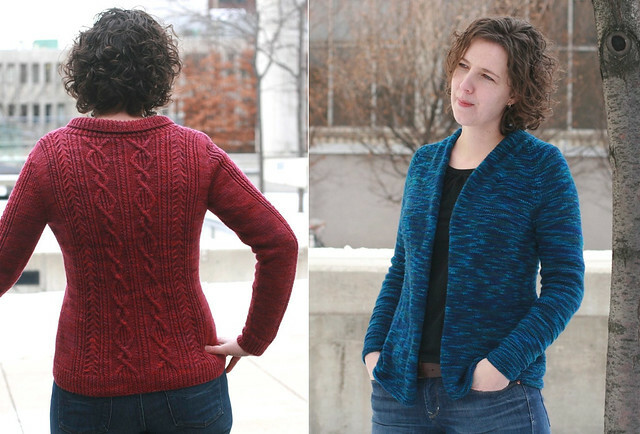 (Horizontal, Above) Row 1: Rhonda's Cashmere Affection, Evelien's Ombre Cardigan, Sarah's Rainbow Taffy Sweater. 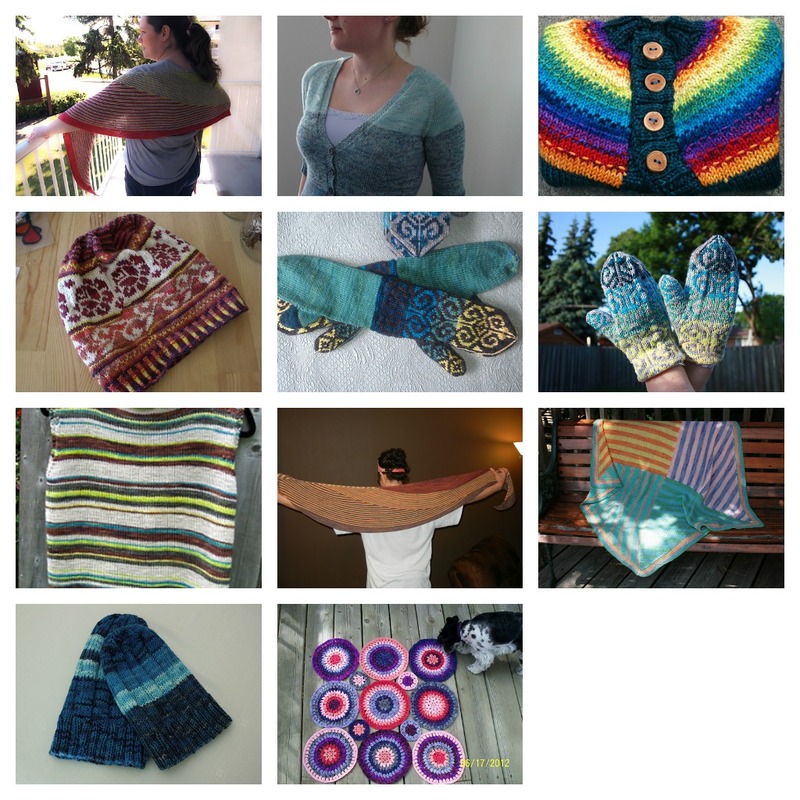 Row 2: Yen's Four Season's Autumn Hat, Duncanch's Honeytree Vest, Jamie's Fiddleheads One and Fiddleheads Two. 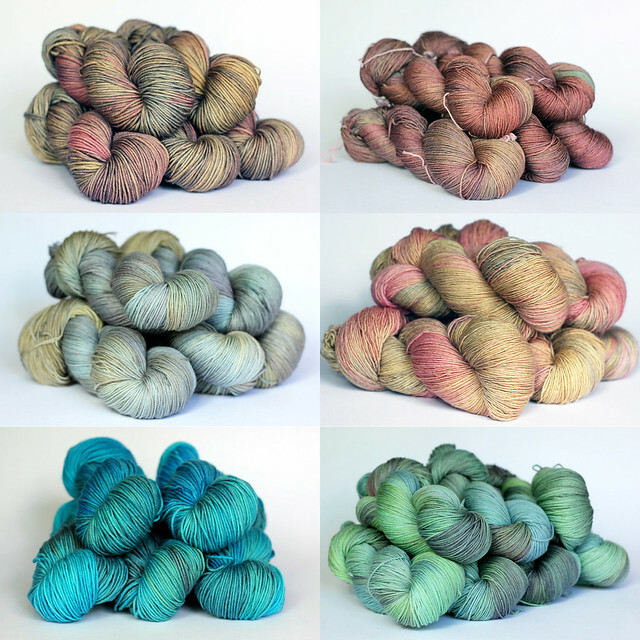 Row 3: Sarah's Suggestibility Shawl, Denise's Think Outside the Box, Sweetheart , Noreen's Pastel Baby Shane and Blue Hats. 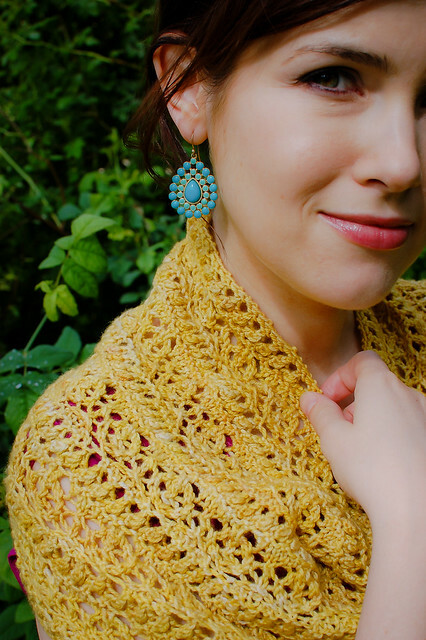 It's so amazing to see all the wonderful colour combinations that people came up with, it's definitely got me thinking about new combinations for future projects. Even the great WIPs that didn't quite get done in time have been beautiful and inspiring. A big congrats to everyone who participated! Sigh, is our week of Stella Collection blog posts already over? I'm sad to see them go, this has been such a fun project to work on with Julie. Maybe the first of many collaborations? 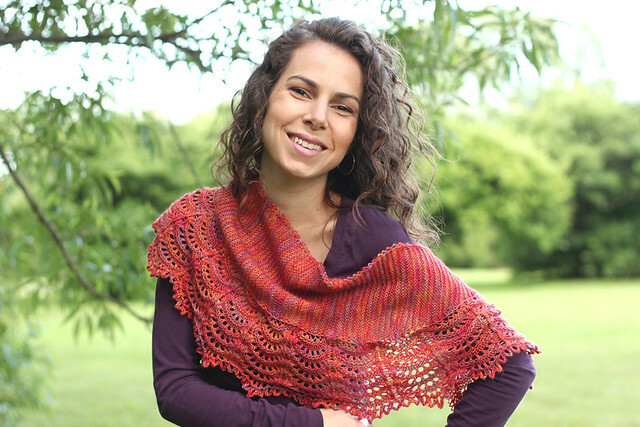 We close out the e-book with the Nashira Stole by Julie Crawford. 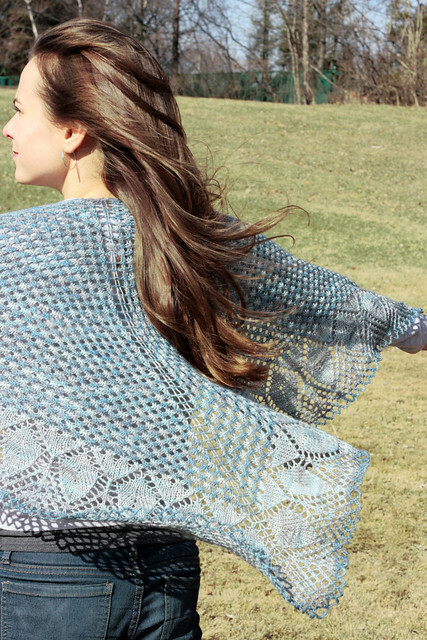 This elegant pattern is kicked up a notch done in the luxurious Silver Label Mulberry Silk yarn. 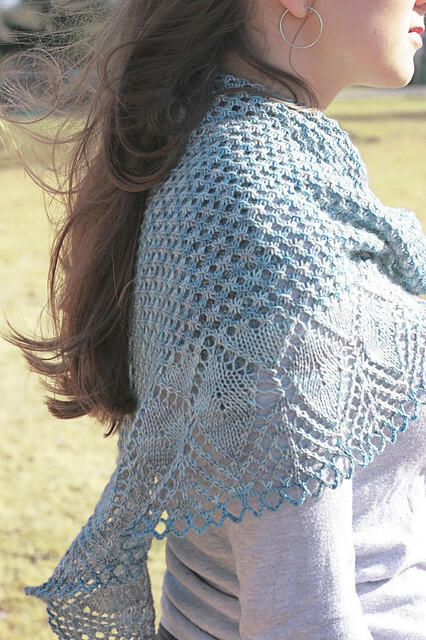 Julie has kept the motif simple by using a graphic geometric design for the body of the stole and adding flair and impact with the gorgeous petal shapes that cap off the ends. I love the balance of simple modern lines combined with feminine lacy details. This is definitely one of those perfect accessories to take you from day to night, casually-chic to evening-elegant! Size: 11” wide and 55” long after blocking. Yarn: 1 skein of Tanis Fiber Arts Silver Label Mulberry Silk, 100% mulberry silk 115g (4oz) = 500m (550yds) sample shown in Dove. Needles: 3.25 mm (US 3) straight or circular. 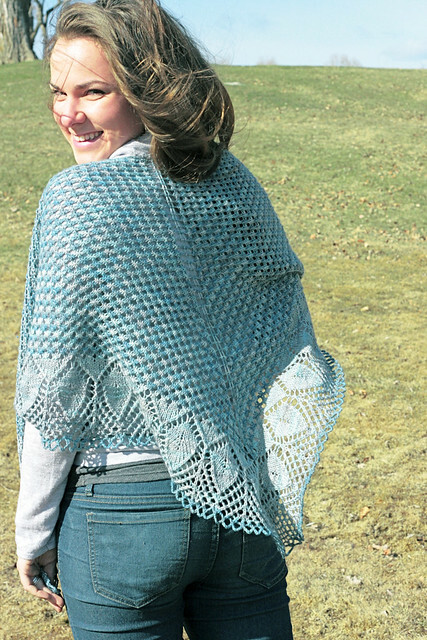 Gauge: 23 stitches and 22 rows of main body (rows 1 and 2) on 3.25mm needles = 4” squareafter blocking. Size: 54” across top edge, 13” from center back to bottom point. Yarn: 1 skein Tanis Fiber Arts Red Label Cashmere/Silk Single, 75% merino, 15% cashmere, 10% silk 115g (4oz) = 385m (420yds) sample shown in Sunset. 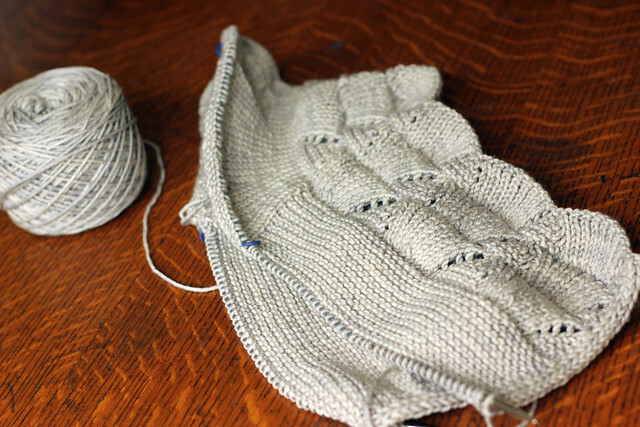 Gauge: 24 sts and 24 rows = 4” in garter stitch after blocking. 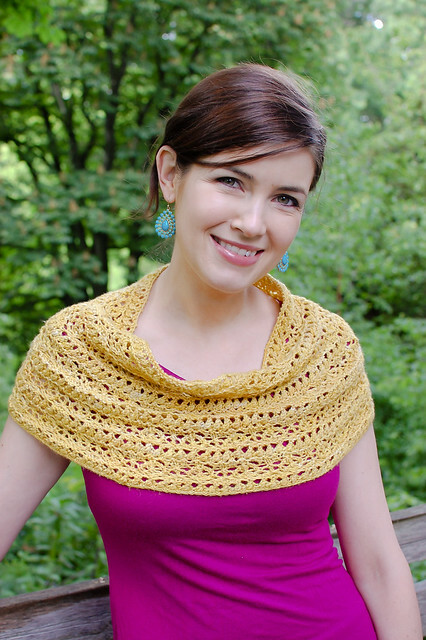 The Solaria Cowl, designed by Julie Crawford, is the second pattern in our Stella Collection e-book. 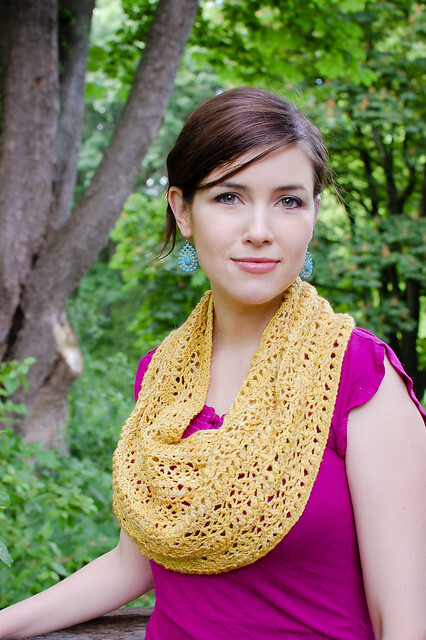 Julie designed this cowl to feature lots of texture and a really cool round lace motif. It's strikingly original and my favourite thing about it is the unique caplet shape which makes it a very versatile wardrobe piece. 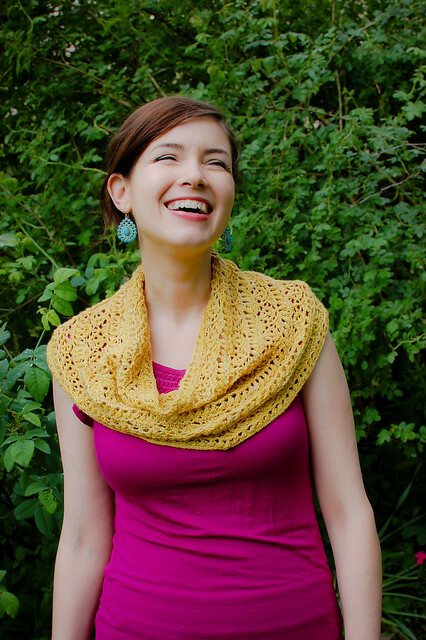 It can be worn pulled down over the shoulders like in the photo above, or draped casually around your neck like in the photo below. 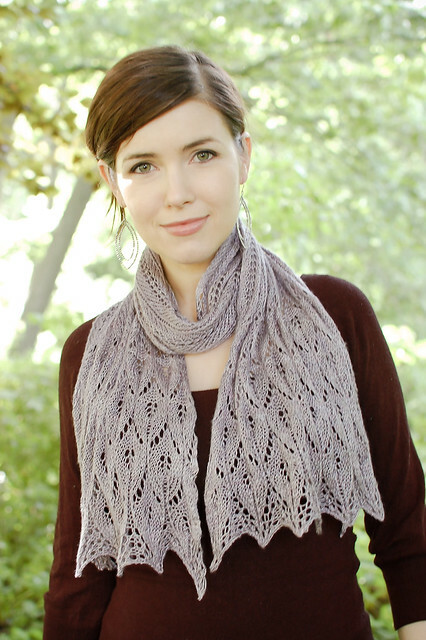 Either way, the incredibly soft Purple Label Cashmere Sock yarn and awesome lacy texture of this cowl are just the thing to dress up any outfit. Yarn: 1 skein of Tanis Fiber Arts Purple Label Cashmere Sock, 70% merino, 20% cashmere, 10% nylon 115g (4oz) = 365m (400yds) sample shown in Gold. Needles: 3.5 mm (US 5) 24” circular needle. Additional Tools and Materials: One stitch marker, tapestry needle. 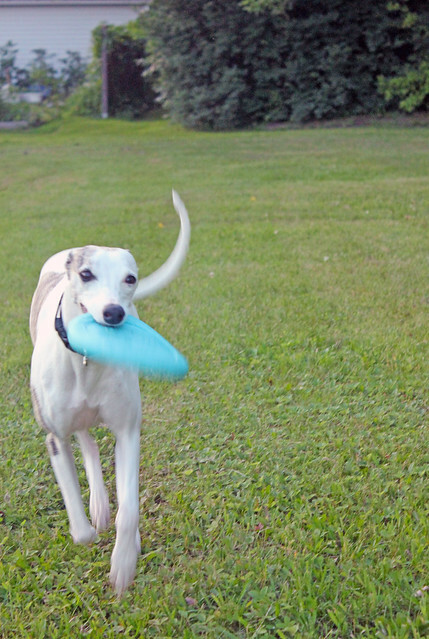 Since my knitting didn't seem to be particularly cooperative this week we decided that an evening of playing frisbee was in order. 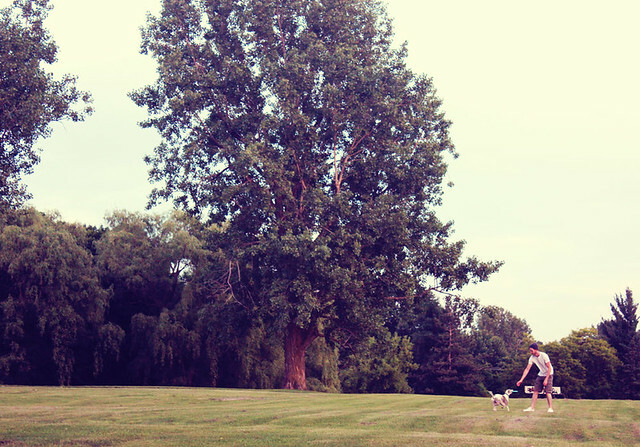 It's hard to say who had more fun, both Stella and Chris were completely tuckered out by the end of it. A winner and a portrait! And the winner is..... MelissaHB! Yay! 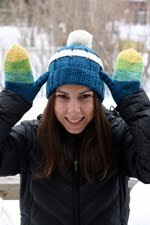 Congrats Melissa, send me an e-mail so I can hook you up with your awesome new pattern collection. And another big thanks to Glenna for A) creating this masterpeice, and B) sponsoring this giveaway! 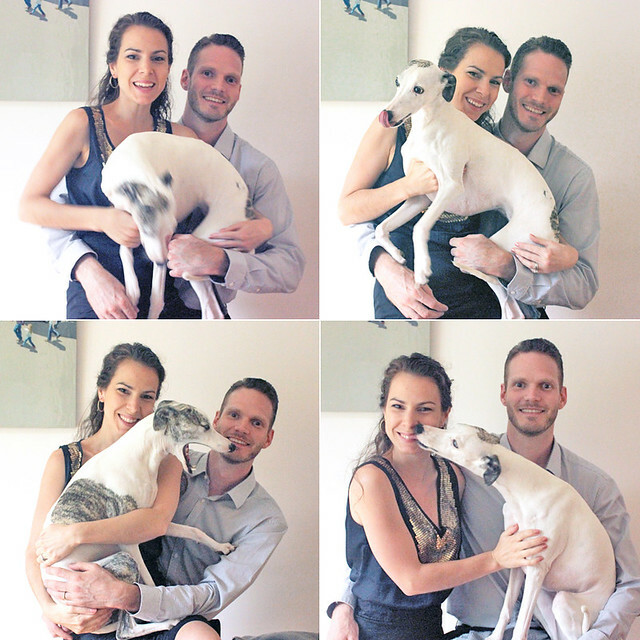 In other news, since yesterday was our 2 year wedding anniversary, it was time to dig out the tripod and try and get Stella to pose for a picture.... Our final collage is more of a blooper reel then a proper anniversary photo. 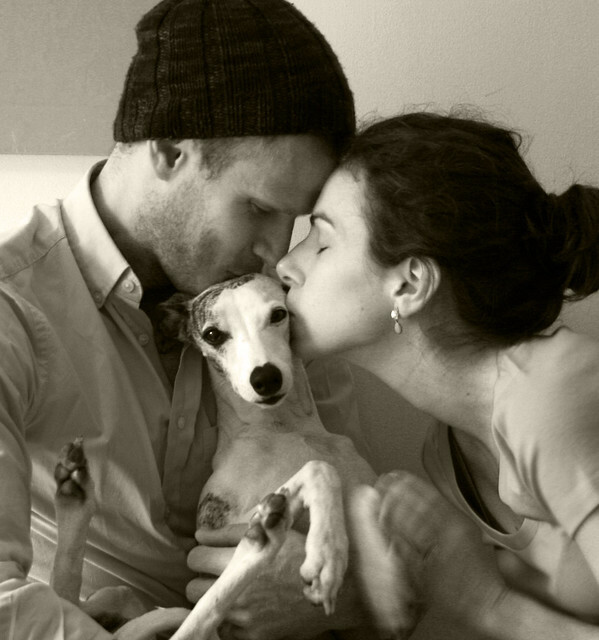 But it's so true to life, we're not perfect, and neither are our family portraits! Clockwise from top left: Stella trying to jump down, Stella sticking out her tongue, Stella giving mommy kisses, Stella in the middle of a massive yawn. 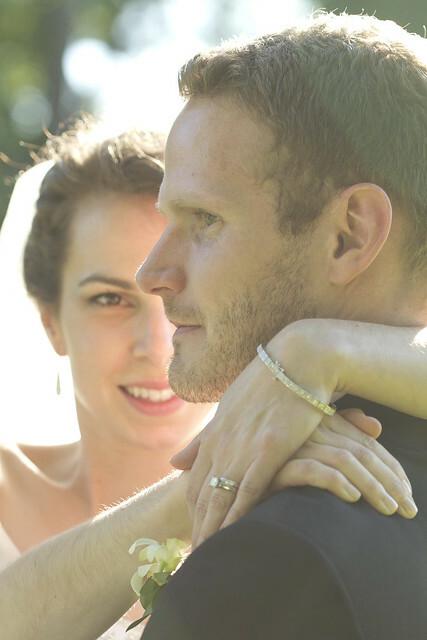 Two years ago today I married the love of my life. It was the best decision I ever made. Giveaway! 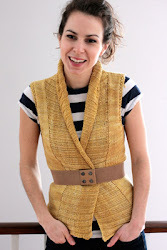 The Urban Collection by Glenna C.
Have you all seen the latest collection from the awesome and talented Crazy Knitting Lady, Glenna C? 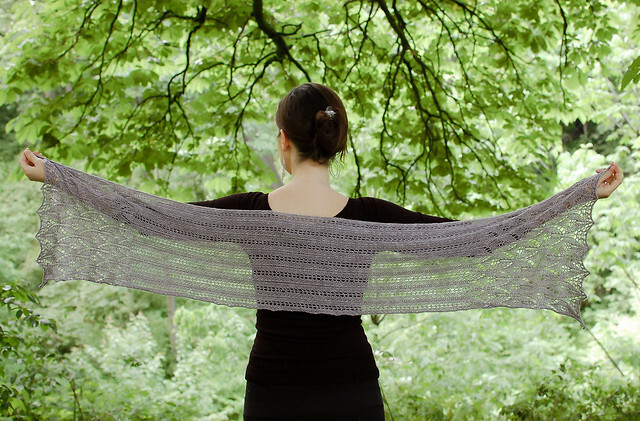 She has been introducing the patterns in a staggered release since February, now they are all out, the collection is complete, and she's given us a masterpiece! 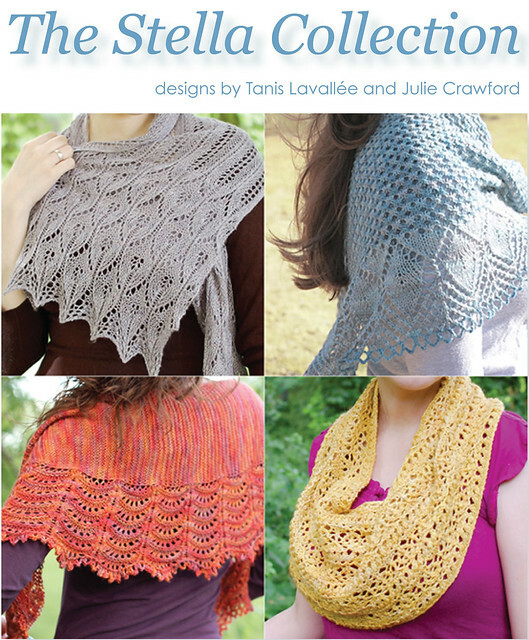 I am only slightly biased because this collection features exclusively TFA yarns, which is amazing. 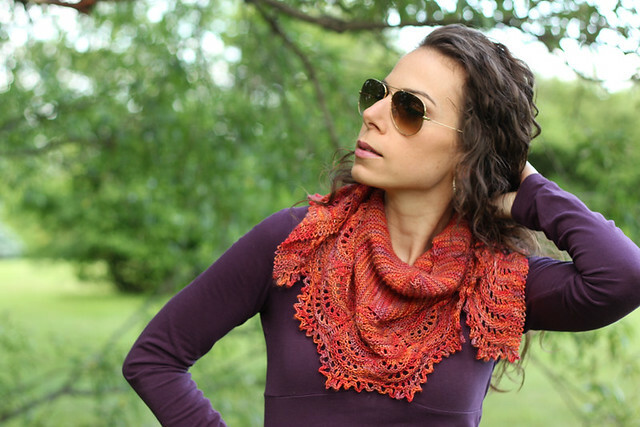 The Urban Collection truly features something for everyone, from sweaters to smaller accessories, lace to cables... Glenna has covered all of our knitting needs. 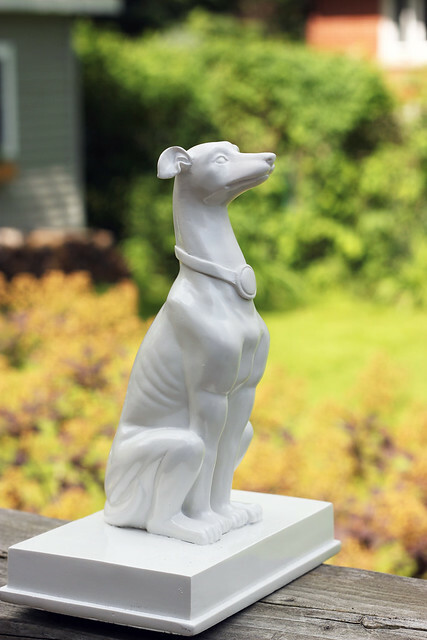 Glenna has mastered effortless, classic style. All of these pieces could become wardrobe staples for years to come. 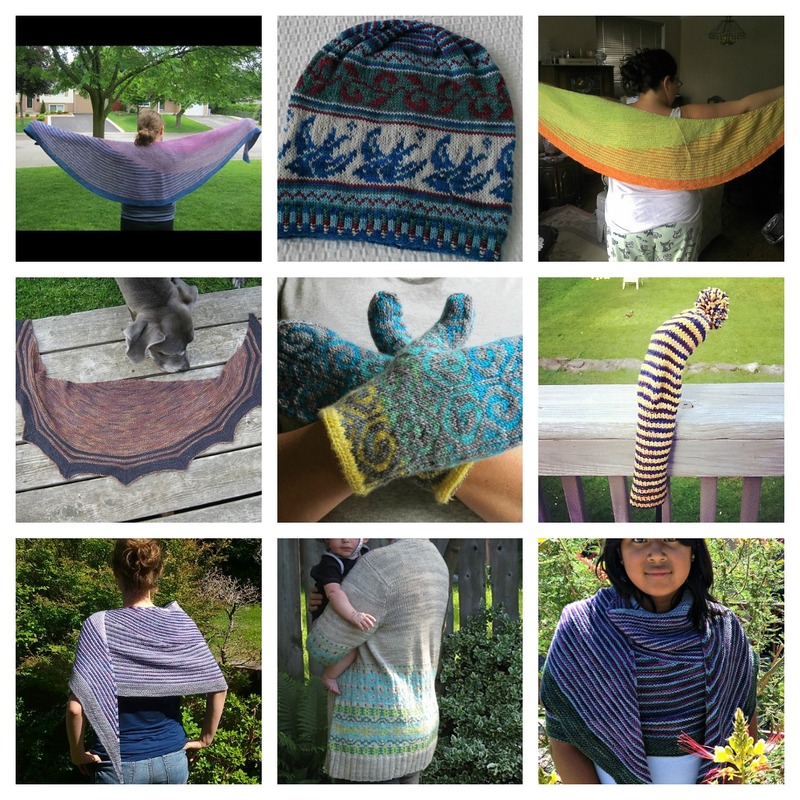 For all the details about each individual design click on the Ravelry links under the photos. Glenna has very kindly agreed to sponsor a giveaway this week! The winner will receive the entire Urban Collection pdf! To enter, leave a me a comment telling me which pattern you would cast on for first. A winner will be announced on Wednesday, June 13. I know, it is impossible to pick a favourite, I'd like one of each please! 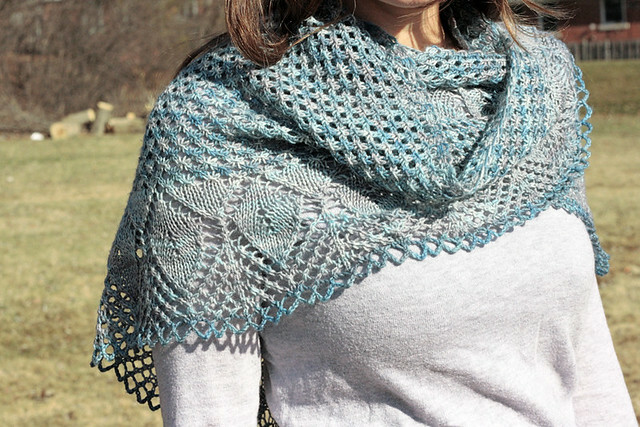 The Lakeshore Shawl in Silver Label Mulberry Silk is off the charts gorgeous, but there is something about the Queen St. Mitts done in Purple Label Cashmere Sock in my brightest Lemongrass colourway that really tempts me. 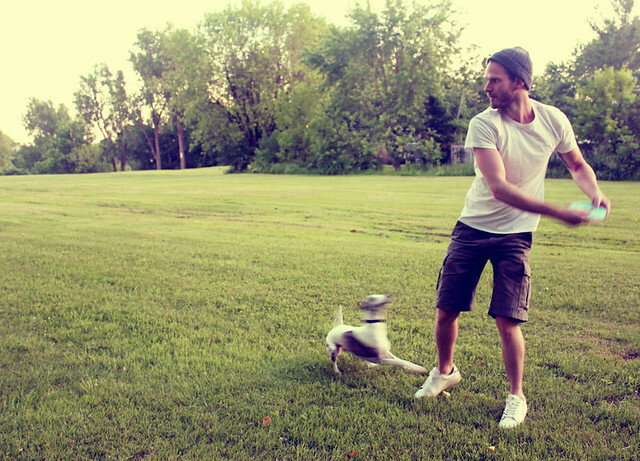 Source: Thanks to Glenna for letting me borrow all of these lovely photo's! While shopping for my *almost here* new niece or nephew I spotted a very cool toy. It's more of a pretty objext than a toy, though maybe it's really fun for babies to play with, for me, it's just really fun to look at! 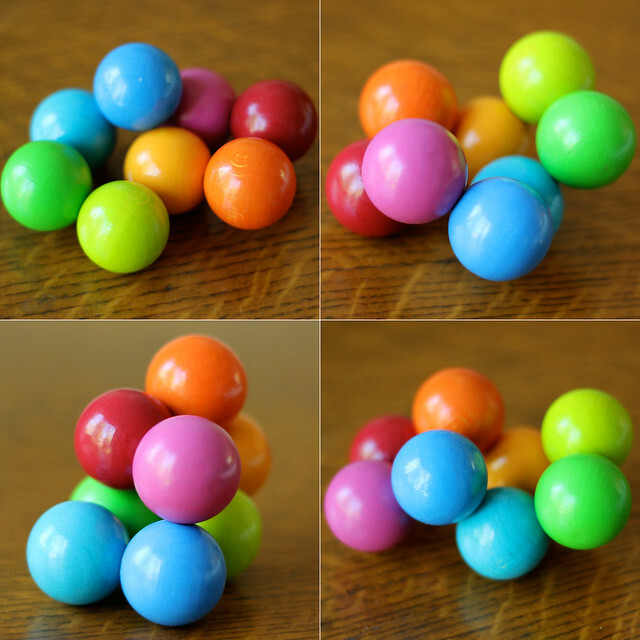 Just a bunch of beautifully colourful wooden balls on a string. I've been admiring it all week. It's such a nice change from all the loud plastic toys I've been seeing. So simple. 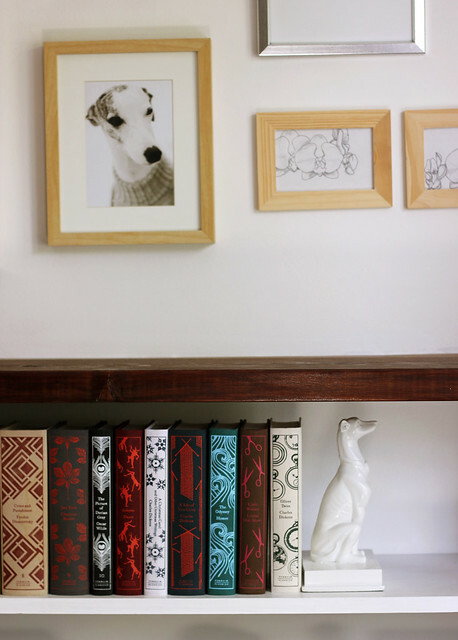 I love my new Stella bookend. And.... another new hat! This time I'll let the photo's do the talking (mostly). 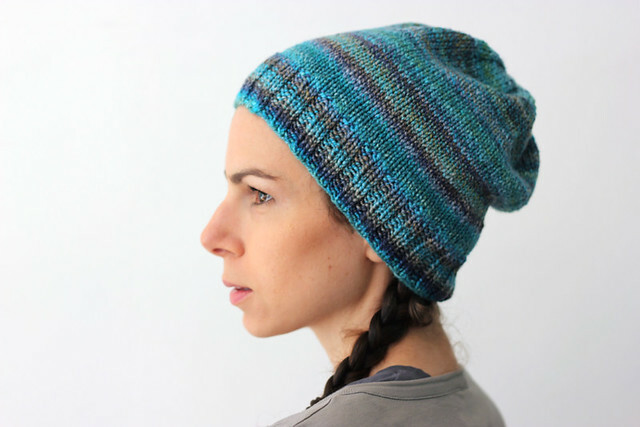 I had a gorgeous skein of handspun, so I knit a simple, slouchy hat to make the most of it. Pattern adapted from my Grammy's hat pattern, I just omitted the ribbing on the body. Love.